The iPad (pronounced “eye-pad”) is a type of tablet computer, produced by Apple. They are basically a larger version of the iPhone or iPod touch. The new iPad (third generation – referred until now in the media as the “iPad 3”) was unveiled on March 7th 2012 by Apple CEO Tim Cook. The new iPad features various improvements including a ground-breaking HD quality “Retina Display”, 5 mega-pixel camera and faster dual core A5X processor. Click here to read more about the new iPad. The new iPad features a 2048 by 1536 pixel “Retina Display” screen. The screen is so powerful that it is reported to have over 50% more pixels that a standard 1920 by 1080 pixel HD TV. The screen sets it apart from the pack in terms of quality, setting a new standard in tablet computing. The new iPad is 4G enabled, meaning it can connect to super-fast 4G broadband – though that the capability is as yet reported to be unavailable in the UK. 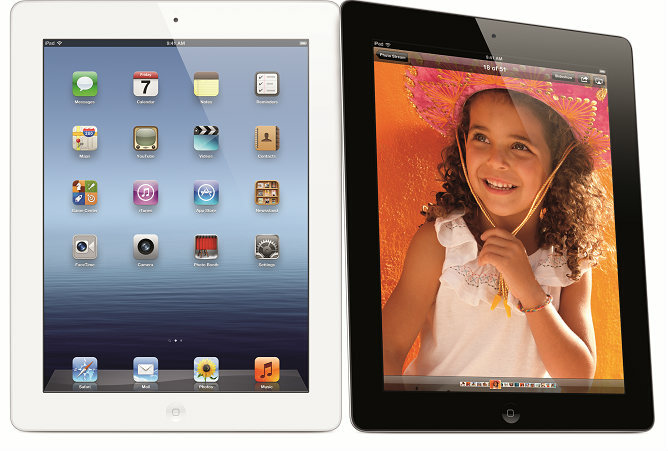 There are six different types of the new iPad, with a Wi-Fi and Wi-Fi + 4G; and a black and white version of each size. The Wi-Fi only version does not have 4G connectivity, but can connect to the internet via Wi-Fi. The iPad 2 is the second generation of the device, unveiled March 2nd 2011, and released internationally on the 25th of March 2011. The iPad two is 33% thinner and has a faster dual core Apple A5 processor. A new self-cleaning iPad case was also launched by Apple, available in a range of colours. Wi-fi only – Connect to the internet by wi-fi only. Wi-fi & 3G – Connect via wi-fi, or via a 3g connection. The iPad was discontinued March 2nd 2011, but is still available from many places. Official Apple trailer for the new iPad. 5:33 long and goes into a good amount of detail on the new iPad. A quick side by side video review of the new iPad vs the iPad 2. The close up of the two screens shows visibly the difference in quality. Not very heavy on the talking/analysis point of view, though as the new iPad reaches general circulation there will be many more reviews available. A nice video that shows some of the differences between the original 1st generation iPad and the later 2nd generation iPad. This video could be useful for anyone who wants to compare the two different iPads. The video presenter makes a good point that some people may want to find out whether it is worth saving a bit of money and buy the original iPad. Another nice side by side comparison of the iPad vs iPad 2. This video gives you a really nice quick lay-mans overview of why the second iPad is a fair bit better. Both video reviewers seem to really be convinced that the iPad 2 is a better investment than the original 1st generation.